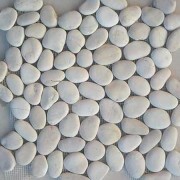 Kashmiri Pebbles supplies one of the largest range of bagged Natural and Polished Pebble products in the Australian market. You can choose from a range of styles, colours and textures to add depth and visual interest to your indoor and outdoor spaces. 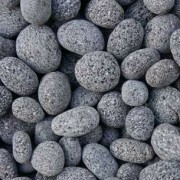 You are limited only by your imagination with the Kashmiri Pebbles range. The Kashmiri Pebbles range consists of natural tumbled and crushed pebble, polished tumbled pebble, crushed glass stone and mosaic pebble tiles. The range has been carefully sourced and selected from the leading suppliers and manufacturers in India, China and Indonesia and brought to the Australian market for use in domestic and commercial landscape applications such as pebble mulch and ground cover, landscaping feature areas and water features to name a few. Please browse our large range of products below and visit our Stockists page to find a supplier near you. 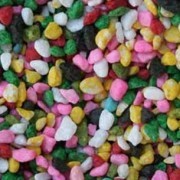 Glossy and tumbled smooth pebbles available in range of vibrant colours. Pebbles and crushed gravels with a matt in texture and an interesting mix of colour options. 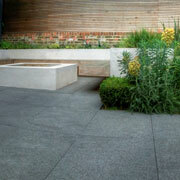 Available in a variety of colours and styles, Pebble Tiles can be a unique addition both indoors and out. New to the market and just a little bit different with bright and vibrant colours. A selection of Granite, Basalt & Bluestone pavers in a range of hues. 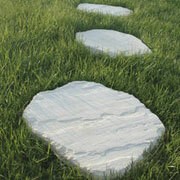 Hand cut natural stone block perfect for garden edging. 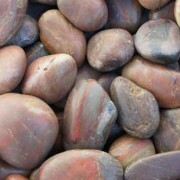 The most common use of Kashmiri Decorative Pebbles is as a mulch in garden beds. Pebble mulch is a great option for a number of garden types and although initial install costs might be slightly higher than traditional tree mulch, long term maintenance costs will be greatly reduced. Tree bark and mulch, being organic in nature will inevitably break down and require replenishment. Expect to be replacing your mulch every 6-12 months and bark every 12-18 months. Decorative pebbles on the other hand can last a lifetime. One of the best way to smarten up an otherwise bland area in the garden is to add a little colour. If you have a neglected corner or area of the backyard a decorative polished pebble or natural pebble or gravel might be your best option. It’s always recommend to spread your pebble choice at least a 50mm thick in order to get good even coverage and weed control matting is a must in these areas. 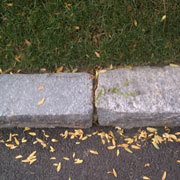 In most cases with the use of weed mat (and a little bit of weed killer), the pebbles can go down straight over the existing surface for an instant facelift. Using a pebble as a feature in a pot or unused corner of the yard is a great way to add colour to your garden. Sometimes planting into ground is just not possible whether you’re renter or you have limited space. Our range of pebbles are perfect to use in the top of larger landscaping pots as protection for the potting mix and plants as well as giving an instant visual facelift. With all the colours available, you will have no trouble matching your pebble choice to your house, pot or garden colour scheme. Kashmiri Pebbles are also perfect for water features. When wet, Kashmiri Pebbles with darken and turn a rich vibrant colour and with the addition of rippling water the visual effect will be an amazing addition in your garden.